There is big news in the canning world people, hot off the presses! This comes straight from my Master Food Preserver meeting this month, and you’ll start to see the recommendations coming out on the packaging soon. What packaging? Your canning lids! The tool you are looking at pictured below will never be needed again. Yep, that fun lid magnet that is either barely magnetic enough to pick up a hot lid, or so magnetic it picks up 4 (like the one in MFP class) is no longer a necessary tool in your canning kit. We no longer need to preheat our jar lids people! According to new recommendations by the makers of Ball and Kerr lids, there is no need to heat your lids anymore. 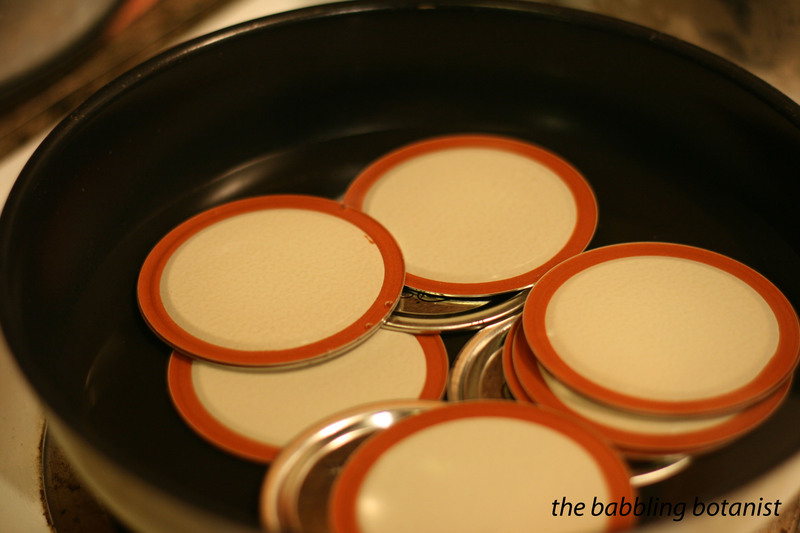 This is the last picture you’ll see on my blog of jar lids warming before they are put on the jars. They’ve been testing the lids, and with the sealing compound they make these days, they don’t seal any better if they are heated before going on the jar. So, you can start skipping that step. Wooohoooo 15 seconds saved! But really, I am quite happy to hear this because it always seemed unnecessary to me, but being a good little rule follower I usually remembered to do it. Or at least remembered at the last second and dipped my lids for a second into the canner that was warming up and figured that was good enough. Hopefully none of you bought this ridiculous tool recently or you’ll be looking for some other use for it. Good luck. That’s $9.14 well wasted. I guess if you ever needed to sterilize the lids for another purpose you could still use it?? Ha. But anyways, the official ruling is to just wash the lids as you would the jars, and use them. Remember, as always, they are still meant for single use. Happy canning! Ooh, interesting! I always thought heating up jar lids was pretty silly too, especially considering how HOT it usually gets in a canning kitchen. Thanks for the info! I wonder if this is going to hold true for non Ball and Kerr lids. Walmart has their own brand called MainStay and I have found that if I don’t heat them for at least five minutes, they do not seal consistently. Being that they tend to be nearly $.50 cheaper per dozen, I’ve been using them. The time saving aspect of using the Ball without having to heat them might have me revisiting using them. Huh that’s very interesting. I have not used those lids, I wonder what is different about the sealing compound. I usually just stock up on a bunch every time they are on sale. Good to know though that other brands may still need to be heated. Walmart’s own brand of lids are made in China, or at least that was true the last time I bought some. Kerr & Ball say “Made in USA”, or at least that was true the last time I bought some. Frankly I don’t trust the Chinese when it comes to anything that comes in contact with food. Nor do I eat any food from China. There is too much pollution over there and it’s said that bribery is commonly paid for inspectors to overlook such things. Thanks Howard, good to know. I can’t say I’ve ever tried those, and think I’ll stick with ball too. Yes, I’ve heard that also. The new bpa free compounds are the ones that don’t need to be preheated. I always thought that you were heating the lids so that they don’t introduce germs or microbes into the food that goes in the jar. You sterilize the jars in your canner, but the lids couldn’t take quite that much heat prior to canning so you just put them in simmering water. While the lids just need to be cleaned now, I assume the jars still need to be sterilized? Hi Patti, that is definitely a great question. You don’t need to sterilize anything, just clean it, if you are canning for 10 minutes or more. This is long enough to kill anything that might be a concern. However, some jams and jellies are only canned for 5 minutes, so in this case you would still want to sterilize. What I typically do is just can those recipes for 10 minutes anyways, since I don’t feel that it makes a difference in the quality of my end product and is faster and easier. Thanks for the question! I always clean my jars in the dishwasher, then just before using, I boil them for several minutes in the water bath canning water. Can you ever, ever be too clean? I also heat my jar lids to soften the rubber of the seal. When I don’t, they don’t always seal. When I do, I have a good success rate. I have to go on what works for me. Perhaps others have different results – obviously so. I will continue what works and leave the new rules and ideas to you. While jar lids are sitting in scalding water for a few minutes, I am preparing the jars. It takes no more time to heat them as it does not to. What is the big advantage? Perhaps it is because I buy my lids in bulk and I have to presume that they come from out of the country. So that may be the difference. Since I go through them in mass quantities, I buy at the best price. If that means that they have to be heated, so be it. Sounds good to me Mari, you definitely can’t be too clean or too safe. I think I’ll try not heating them for a while and see how it goes. 🙂 Happy canning! It is worth the extra 50 cents to buy BPA free lids because heat releases chemicals from BPA products into food.